➡ View the complete range of Mining Cables – this includes low, medium and high voltage flexible trailing and reeling cables to provide electrical power and supply in underground and surface mining industries. Cables approved and manufactured to DIN VDE (German), BS (British), ICEA i ASTM (American), NF C (French), SANS (South African), GOST (Russian) and other international harmonized mining standards widely used throughout Europe and the rest of the world. Cable manufactured to BS6708 standard for underground lighting, power distribution, shuttle cars, coal cutters and operating face equipment – 1,100V, 3.3kV, 6.6kV and 11kV medium voltage power cables are available. T&D supply from stock UK and international projects with competitively priced mining cables and a full range of cable accessories, such as cable joints, glands and cleats from leading manufacturers including CMP, Ellis Patents and 3M – a complete range of high voltage joints, terminations and connectors are available for use with MV-HV mining cables up to 33kV. All mining cable accessories are specified and manufactured to protect the circuit integrity and safe operation of underground and surface mine cables – this includes flameproof Group 1 mining cable glands with ATEX and IECEx approval for hazardous area locations and potentially explosive atmospheres, flexible cable repair joints and stainless steel cable cleats with high fault current rating for short circuit situations. 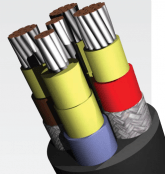 We can provide a complete single-source project supply for all Mining Cables & Cable Accessory requirements.